At the beginning of this month, I posted my first card made using the Gypsy (here is a LINK to the post). I used the Gypsy Wanderings cartridge to create the card. Several people asked if I could share the file or recreate it in Design Studio. I could recreate the file in Design Studio but, unless you have a Gypsy, you would not be able to cut the file since the Gypsy Wanderings cartridge is an electronic cartridge and is exclusive to the Gypsy. In fact, until the transferring of files between Design Studio and the Gypsy is sorted out, you wouldn't be able to cut the file at all. I made a Design Studio file using Accent Essentials and Base Camp. Above you can see the preview of the card. 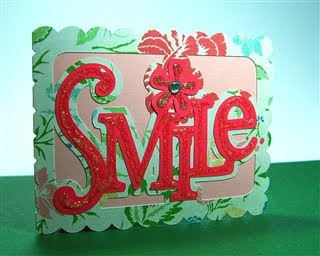 The base of the card uses a frame and the blackout of the frame from Accent Essentials. I made the word art using Base Camp and a flower from Accent Essentials - the look is similar but not identical to the Gypsy Wanderings word art. The shadow version of the letters is welded into the frame. I then created a matching top layer using the plain version of the font. I altered the size and shape of most of the letters to suit the project. 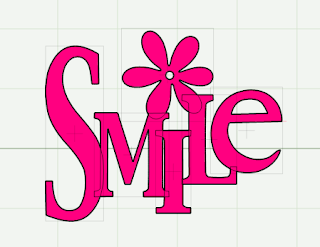 There is an extra page in the file with the "Smile" top layer unwelded - this is just for preview purposes and should not be cut. Since I am at my Dad's and don't have a Cricut here with me I am doing something I have never done before - I am sharing the file without cutting it to test it first(!) I'd really appreciate hearing from you if you download the file and cut it. It previews fine, but try it on your "not-so-favorite" paper if you want to be sure before you make your final version. I will try cutting the file when I get home, but I didn't want the people who have been asking me for this to have to wait any longer. One other note - Several people who subscribe to my blog have contacted me to say that the morning emails are appearing garbled with words on top of photos. I have a "test subscription" to my Verizon account which I look at on a Mac (using Safari). There has not been a problem there. I don't know if the problem might be caused by the browser that people are using or different computer setups...interestingly enough, when the emails telling me that they are having trouble have arrived and the original message is quoted - it appears correctly (I use Firefox on my laptop). If you are having trouble, perhaps you could try viewing the email through a different browser. You could also "follow" instead of subscribe, but that would not solve the email problem. I wish I had an explanation with a definite solution - I will try to find out more once I am back home again and let you know if there is a way to make the email look "right" again. I don't actually send the emails from my computer - they are sent by Feedburner automatically to anyone who subscribes and confirms their subscription. Thanks. This is gorgeous Diane! I want to come over and play in your craft room with you, maybe some of your creativity will seep into my brain! Diane this is a really cute card! TFS! Diane this is soooo cute. I listened to the video and wrote down everything (my pea brain can't remember it all)so this afternoon I'll try to make one myself with my gypsy. Thanks and keep them coming.